"At least I did not put them off the job!" said Arsene Wenger last week, as two of his old Arsenal stalwarts, Thierry Henry and Patrick Vieira, prepare to go head to head on Friday. Vieira's Nice will visit Henry's Monaco in a Ligue 1 derby match that could go some way towards defining just how successful their first seasons at their respective clubs will prove to be. Things have not gone too well for Henry, who only managed his second win since taking charge in mid-October on Tuesday against Amiens. They remain level on points with two sides still in the bottom three. Vieira, who returned to his homeland after honing his skills with New York City, has put Nice in the European reckoning but has seen their form stumble with back-to-back goalless draws. A four-time champion in England's top flight and Arsenal's captain fantastic in Wenger's early years in charge, Adams has not quite matched those lofty standards as a coach. He had a year at Wycombe Wanderers and a little over three months at Portsmouth, both of which were pretty miserable. When Granada came calling last April in a desperate bid to avoid relegation from LaLiga, Adams took charge for seven matches and lost all of them. Campbell was another centre-back extraordinaire under Wenger after his acrimonious move from Tottenham, and is the most recent convert to the world of management. The 44-year-old chose a real challenge for his first appointment, taking over League Two's bottom club Macclesfield Town, who have won three league matches all season. His first game ended in a penalty shoot-out defeat to Newcastle United in the EFL Trophy on Tuesday. 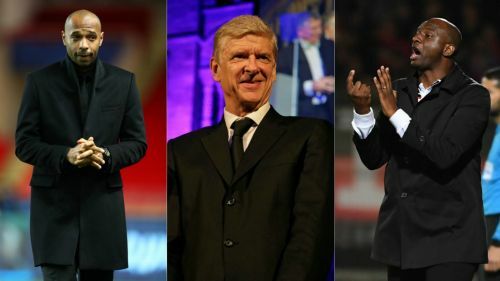 He only spent three years playing under Wenger before retiring in 1999, winning the Premier League the year before, but it was not until 2011 that Garde took up his first head coach role with Lyon. Under Garde, Lyon won the Coupe de France in 2012 and the Trophee des Champions in the same year, before he took over at Aston Villa in November 2015. He only lasted until the following March. These days, he is in charge of Montreal Impact. 10% - Remi Garde had the lowest win percentage of any permanent Aston Villa manager in Premier League history (10%). Adieu. Luzhny won a Premier League title under Wenger before stints with Wolves and Latvian side Venta, where he became player-coach for a spell in 2005. After hanging up his boots for good, the former Ukraine international became assistant at Dynamo Kiev and was twice interim head coach before landing the top job at Tavriya Simferopol in 2012. He is now back in Kiev as an assistant again. Although his finest years as a Gunner preceded Wenger's arrival, Merson did play under the Frenchman for a year before he had positive spells with Middlesbrough, Aston Villa and Portsmouth. After joining as a player in 2003, Merson became Walsall manager a year later, but constant line-up changes and supporter unrest led to him being sacked after a 5-0 thrashing by Brentford in February 2006. He is now a television pundit and columnist in the UK. Platt was approaching the end of a storied career once Wenger took over and left after the manager's first two years in charge. He was briefly Sampdoria boss but resigned after six matches, with other Serie A clubs angry that he was appointed without coaching qualifications. A player-manager spell with Nottingham Forest followed, before three years in charge of England Under-21s. After three years on Manchester City's staff, he spent a year in India with Pune City, and is now part of a consortium that has bought Palermo. Van Bronckhorst won the Premier League and FA Cup under Wenger before leaving for four successful years with Barcelona in 2003 - a spell which included a Champions League final triumph over the Gunners. He then returned to boyhood club Feyenoord, finishing his career in 2010. After a year in charge of Netherlands' Under-21 team, he went back to Feyenoord and worked as assistant coach for four years before taking the top job in 2015. Five domestic trophies have followed in that time, leaving Van Bronckhorst the coach tipped for bigger things. Arsenal FC: Was it all down to Arsene Wenger?